The short stretch of the Gade controlled by Watford Piscators has a history of unusual catches. Main species present include chub, bream, pike, carp, bleak, roach & perch. 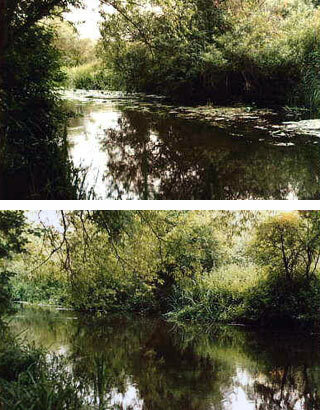 Its a fairly natural river which slowly meanders through often dense marginal weeds and cover and provides an ideal place for large fish to hide. There are regular reports of large roach (2lb+) being caught and also some larger chub. The chub are most often caught using either a feeder or on a straight lead. This photo shows the bottom of the river Gade as it merges into the Grand Union Canal. This is a very productive area with a reputation for large roach and the occasional big carp putting in an appearance.